A style signifies the manner in which something, including a work of art, is done and, more particularly, the trace that the artist’s way of working leaves in his artifact. . . . An artist is said to have a style when his characteristic manner is evident in his works. However the style arises in the actual process of working—how he handles the brush or which patterns of vocabulary or syntax occur to him—[it is] significant only in the pattern of traces left in the artifact itself. A style, then, is a series of traits or features that help to characterize a work. Well-known artists (writers, painters, musicians, etc.) are often defined by such features—think of Pollock’s drip paintings, Mondrian’s grids, Caravaggio’s chiaroscuro, Proust’s paragraph-length sentences and flowing line, the poetry of Mallarmé. We come to know them through various formal elements, which we can use to distinguish their work from that of others. Criteria such as these, whatever the field, are useful for art historians, scholars, and critics; not only do they help identify an artist but they also help isolate schools or camps: art historians speak of the “school of X and his followers,” for example. Literature has its realists, surrealists, experimentalists, formalists, and so on; in addition to the various genres. Then there are what might be called supra-personal styles, those that transcend the characteristics of an individual artist and come to represent a particular approach to presenting a work of art, a range of features and gestures that define a way of interpreting experience or a period shared by a number of practitioners. They include regional styles, national styles, even global styles, which are cross-regional and international (international noir in literature, for example). But are there individual styles in tango when it is danced socially and not for the stage? Like all dance, like all performance artist, there is no “artifact” to speak of, no lasting residue, no trace that can later be discovered or isolated. But there are oral and written histories, and film and video more recently. I have read of regional or local stylistic variants among dancers in Buenos Aires. From the descriptions, it’s unclear how markedly different these are from one another, but several have been identified. For example, there is a lengthy discussion on Tango Voice of tango “styles.” Excluding the lengthy discussion about types of embrace and arm placement, the primary difference appears to be that between the “Villa Urquiza” style and tango “estilo milonguero.” I’m going to quote the author since there’s no point in paraphrasing here. In Tango de Salon, the tango danced socially in the milongas of Buenos Aires, there are two main stylistic variants – Tango Estilo del Centro (aka Tango Estilo Milonguero) and Tango Estilo del Barrio (aka Tango Estilo Villa Urquiza) . . . with a considerable amount of individual variation within these somewhat distinct clusters. The primary difference in partner hold between these two stylistic variants is that in Tango Estilo del Centro, the embrace is maintained between partners throughout the dance, whereas in Tango Estilo del Barrio, although the embrace is maintained during walking, it may be opened temporarily during ochos and giros. In general, there is no stylistic variant of Tango de Salon where partners do not embrace the majority of the time during a dance, although, to be accurate, on rare occasions one may see a porteño couple dancing several centimeters apart throughout a dance. Daniel Trenner provides some very interesting background on why the so-called “milonguero” style of the center may have developed where it did. We do know that the city’s center had somewhat different codes than the neighborhoods. Here was where the most aggressive and dangerous, the rich and the extravagant, mixed with the professional theatre, music, and movie crowd. One could disappear and have adventures less likely to be reported on in the neighborhood, one could go seeking adventuresome partners (unchaperoned women, high rolling men). This was the “singles scene”. In this spicy night life of the city center, the close embrace that we foreigners have been less familiar with until lately became popular. This helps to understand why it was frowned upon in the neighborhoods where elegance implied a paper-thin separation of respect between gentleman and lady. Even so, it could be that there were neighborhoods where the close style was preferred. Tango Orillero means “Tango from the outskirts of the city.” If there ever was a distinction between Tango from the outskirts and Tango suitable for ballrooms [tango de salon], it may well have been the distinction drawn by the author of the book on how to dance Tango published in Buenos Aires at the height of Tango mania, between the elegant Tango being danced in Paris and the dubious dance from the outskirts of the city. So it is possible that in the early part of the Twentieth Century there was a real distinction between Orillero and Salon, as the dances of the poor and of the rich. 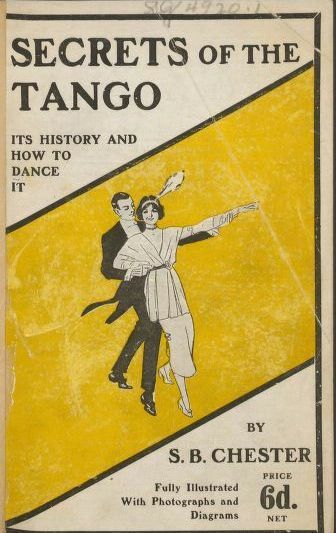 The book Denniston refers to above is Secrets of the Tango, by Samuel Beach Chester, published in London in 1914. A digital version of the book is available online at the Harvard University library. But these local variants, “estilo del barrio,” “estilo del centro,” and so on, are not what I mean by style. I’m circling around the issue, but what I’m looking for is something that typifies an individual manner of dancing; more importantly, how does one develop an individual “style” in tango that is something more than a collection of idiosyncracies and tics? We tend to notice dance styles most among performers since, by definition, they are the most visible and widely filmed proponents of tango. Two of the most notable, and most easily identifiable, styles are associated with Jorge Dispari and Tete Rosconi. Dispari is famous for his beautiful, powerful walk and the measured elegance of his movements. There are many videos of him dancing with his wife, Marita; the following is typical. In the video, which is undated, his long, loping step is clearly visible. His movements are very smooth and fluid, executed with great deliberation. Marita stands slightly off to his right and in that partly open “V” embrace often found among certain dancers. But whether or not his dancing might be characterized as part of a school or regional variant, Dispari has made the dance his own and marked it with his own style. Another man with a very obvious and easily identifiable style is Tete Rosconi. It is a bit exaggerated and not necessarily to my liking, but Tete is a wonderfully energetic performer with tremendous control, and he possesses a profound familiarity with the music. I can’t find the video of him and Silvia dancing to Pugliesi’s Gallo Ciego (although I believe you can still find it at tangoandchaos.org), but here’s another, perhaps more representative of his style. The music is by Juan D’Arienzo. Tete’s steps are shorter than Dispari’s, his movements generally quicker, his footwork a bit more complicated, there are more and faster turns, and he does that very conspicuous thing where he opens his arms and uses his chest to lead his partner. He’s a bit of a showman, a bit of a ham. A contemporary dancer whom I have always admired and who seems to have developed a style all his own is Shastro Rodella. There’s a wonderful languid quality to his dancing and a subtle interplay of movement between torso and feet. His posture is very slightly apilado and he doesn’t bend his knees deeply as many performers often do when walking; the dramatically long steps are also gone. There’s a casual playfulness in his dancing that I find wonderful and largely absent in other dancers. When I showed this to a teacher, I was told he danced “milonguero” style, apparently in contrast to the technically polished, more upright Villa Urquiza “look and feel” that seems to characterize so many of today’s technically proficient young dancers. But most of them leave me cold. Shastro’s way of moving is one I haven’t seen in other performers. That’s not say that it’s unique to Shastro or that elements aren’t shared by many other dancers, but among performers and teachers it strikes me as unusual and particularly noteworthy. The following video, filmed in New Zealand, provides a good idea of how he moves and some of the features that characterize his dancing. I’ve mentioned Ricardo Vidort before. Although there are videos of him dancing, Vidort was not really a performer, not the way Tete and Dispari were. I know he taught for a period of time but most of the videos of Vidort dancing were taken when he was well on in years; presumably people wanted to record him before the opportunity was lost. In comparing him to several other milongueros of his generation, Vidort seems to have something all his own. I’ve always found his style very direct, very forceful, very masculine and unlike his peers in many respects. There is a clear and obvious difference between him and Cartery, for example, or Ismael El Jalil or El Chino Perico. Vidort is not as smooth and subtle, but his musicality is impeccable and he is clearly a master of the dance. For me, he typifies everything that I love about tango; his is a style I would love to emulate but I’m not sure it can be learned or taught, not now and not outside the culture that gave birth to it. And here’s Vidort dancing with Jessica Grumberg. I can’t help but love this video and this man. There is such joy and a wonderful natural ease in his movements. There’s nothing pretentious about it, nothing dramatized, but it’s heartfelt and deeply musical. So, here we have four examples of what I perceive to be identifiable styles of dancing tango. How they might be typified generically, I’m not sure (estilo del centro, estilo Villa Urquiza, etc. ), but they are recognizable styles associated with their practitioners. This leads to the question of how one develops a personal style and if such a thing can be taught? In Vidort’s case, I imagine it was acquired, as with so many men and women of his generation, over a lifetime of dancing in the milongas of Buenos Aires. The same may be true of Tete and Dispari but theirs is a more outwardly directed style, one that demands an audience. Vidort didn’t seem to care much. Whenever I’ve seen him in videos, regardless of the venue, he always appears to be dancing for his own pleasure and that of his partner. Now, it’s possible that after a while, we all develop something akin to a “style.” We develop a way of dancing that may be “ours,” but it is not necessarily a style. It is not uniquely personal, not consciously developed or applied, and rarely rises above the level of an amalgamation of traits and quirks. To develop a style requires a conscious effort to achieve some kind of artistry. It involves a form of self-expression that operates within a system of sorts, with its own codes and strictures. Vidort, and dancers of his generation, seem to have absorbed this unconsciously through force of practice (and observation). How a contemporary dancer can acquire a similar, identifiable style of his own remains an open question. You are currently browsing entries tagged with Daniel Trenner at Tango High and Low.